Telemundo Deportes is a division property of the NBC Sports Group that handles all sports-related content aimed to the Spanish-speaking community in the United States. Due to the lack of broadcast licenses reached by Telemundo Deportes, this network revolves around games featuring national teams. Telemundo struck a deal with FIFA which allows them to broadcast all tournaments organized by football's governing body, including the FIFA World Cup, until the end of the 2026 WC. Tournaments such as the Copa América and the CONCACAF World Cup Qualifiers may also be available. Furthermore, football coverage in Telemundo may also include English Premier League games. Added to football-related coverage, this service may broadcast sports such as boxing, added to their detailed coverage of the Olympic Games every four years. Telemundo is available on DirecTV (Channels 406 and 407 for the respective East & West coast feeds), Dish Network (Channel 835 for the East-Coast feed and Channel 836 for the West-Coast feed), as well as on most cable providers in the USA. On AT&T U-verse, Telemundo is on Channel 3007. Telemundo is also available to stream on fuboTV on the fubo and fubo Extra packages as a local station or a national east or west coast feed. 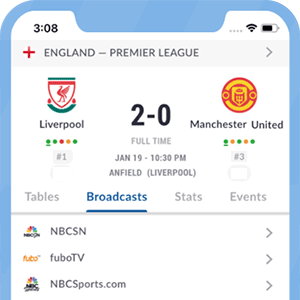 Telemundo also occasionally streams live EPL and Mexican games on its app, Deportes Telemundo En Vivo, for iOS and Android devices. *Got itLive Soccer TV does not provide Telemundo live streaming. The information provided on this page is simply Telemundo soccer TV schedule. Telemundo has acquired Spanish-language TV rights in the USA for the 2018 & the 2022 FIFA World Cups.